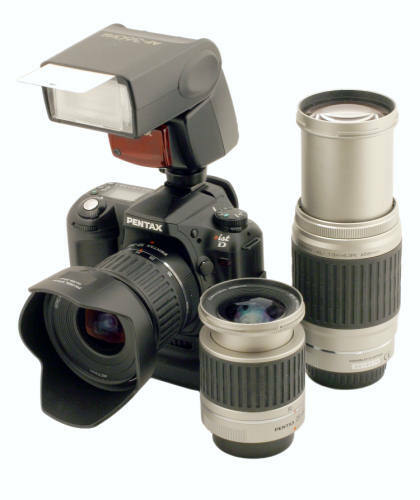 Digital photo cameras have recently become widely popular. Multiple mini-labs printing out satisfactory 10 x 15cm shots even from 2Mp point-and-shoot cameras, low prices for cameras, photo printers and wide spreading of PC made a lot of people enthusiastic about digital photography. An owner of a digital camera can get unlimited tools for editing and preprint processing at the acceptable image quality compared to the traditional film photography. The year 2003 was really booming for digital photo equipment. The digital photo market develops very quickly: a user who wanted to get a 3-5 Mpixel model with inexchangeable optical systems last year had a real problem when choosing one camera among a great variety of similar models. As soon as the manufacturers realized how profitable this market sector was they started the race. When the prices for camera matrices started falling down, the consumer digital cameras quickly overfilled the market. Now the tendency of mass production in this sector doesn't differ from others in the semiconductor industry: companies produce matrices with a great pixel resolution on small dies trying to save on production of all components. The number of pixels grows up and the prices are falling down. Today you can get a 3Mp camera for $700 and a 5Mp one for $400 - it's not easy especially for beginners to find a clue in such situation. I'm glad to see that beginners not just buy the cheapest models of famous trademarks but take a keen interest in principles of operation of optical systems, electronic parts of digital cameras, composition and color; advanced users go with more advanced models. The former high culture and traditions of photography are coming back. Popularity of digital photography is expected to increase even more according to the analysts and companies' roadmaps which demonstrate the increase in the output of digital cameras. Canon that got the first place in Brand 2003: Readers' Version of Digit-Life as a digital camera producer is going to sell 12.5 mln compact models in 2004. It's almost 1.5 times more compared to last-year 8.5 mln cameras. Apart from increasing the delivery of digital point-and-shoot cameras the company also does its best to maintain its leading position as a DSLR camera maker and plans on selling some 500,000 such devices in 2004. According to the experts at Canon, by the end of 2004 the company will control 25% of the digital camera market, - it's greater by 5% relative to 2003 and by 10% relative to 2002. The plans look ambitious: the business group leader says that 25% will be achieved irrespectively of how great the market will be. If the whole market equals 50 mln cameras their share will run into 12.5 mln pieces, if the market totals 55 mln they will get a quarter anyway. Manufacturers rarely unveil detailed roadmaps but we already know that Canon is going to release 18 new models of compact digital cameras (vs 9 compact models in 2003 plus 2 SLR cameras including EOS 300D in 2003). One more grand player on this market - Sanyo Electric - has bolder plans. To satisfy all orders in 2004 Sanyo intends to increase production of digital cameras by 74% up to 20 mln pcs. The company is known not only for production of digital cameras under its own trade mark but also as a partner-manufacturer of at least 5 famous companies including Nikon and Olympus. Almost 90% of its digital cameras are delivered under other brand names. According to the preliminary estimates for 2003 the Japanese manufacturers alone shipped 40 - 44 mln digital cameras. Compare this to 25 mln cameras delivered in 2002. Only notebook PCs are as popular as cameras today. 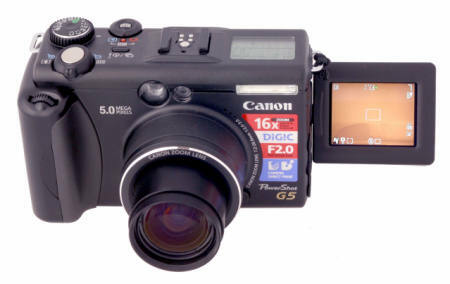 One of the most popular digital cameras is 4Mp G3 (and the 5Mp G5 based on it) from Canon. Another notorious model announced yet in autumn 2002 and managed to maintain its high position during the whole last year is 5Mp Sony DSC-F717. The whole attention of our forum was focused on exactly these models, the guys aggressively discussed their features and advantages, and it seems that exactly these cameras satisfied the most needs of photo enthusiasts. Every one can add his own items to this list but it's clear that such combination especially at the price lower than $1,000 is not achievable yet. Moreover, the price for quality optical systems do not fall down that quickly. Nevertheless, the trend of development of this class of digital cameras is clear. The first steps in this direction was already made. 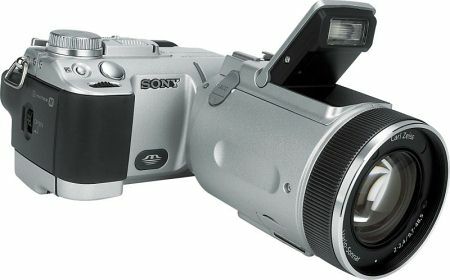 In August 2003 Sony announced the Sony DSC-F828 at the price of $999.95. 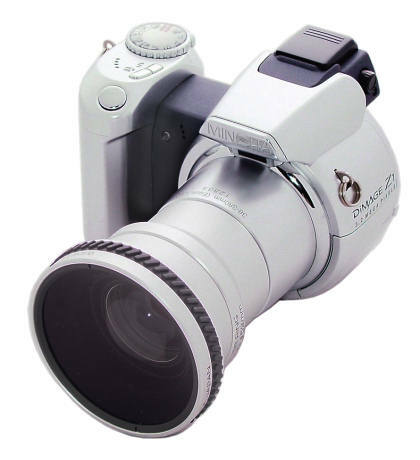 The camera uses the 7x Carl Zeiss T optical system, 2/3" 8Mp Super HAD CCD matrix and 4-color (RGBE) technology for a more realistic color rendering. Beside Memory Stick cards the camera supports CompactFlash memory. This is a good example of the further development of the market. The Olympus E-1 SLR camera announced in the middle of 2003 and started selling by the year-end has an exchangeable optical system based on the 4/3 (Four Thirds) standard. The Open Four Thirds (3/4) Standard developed by Olympus, Kodak and Fujifilm is aimed at unification of digital SLR cameras. The Four Thirds system features the optical balance between image quality, camera dimensions and function expandability. The Four Thirds System is named after the 4/3" CCD or CMOS matrix used in such cameras. The standard is an attempt to popularize the optical system specially design for digital cameras so that lighting were uniform in the center and on edges. For that purpose, the Four Thirds system was calculated so that the lens bore diameter was approximately twice greater than the matrix diameter, in contrast to film 35mm cameras. The square of 4/3" matrixes is 4 times greater than that of 2/3" sensors, not to mention 1/1.8" ones. The developers of the Four Thirds standard say that this will ensure quality equal or even superior to the 35mm cameras. Another advantage of the Four Thirds standard is that the sensor size allows reducing dimension of camera bodies and lenses. 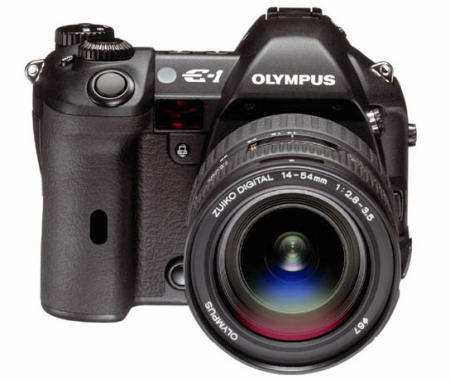 The Olympus E-1 is equipped with a 5.08Mp CCD matrix, (active area: 17.4 x 13.1 mm, pixel size: 6.8 x 6.8 mcm). The camera supports burst shooting up to 12 frames at 3 fps, auto and manual focusing, exposure of 1/4000 to 60 sec, a wide range of white balance settings, JPEG, RAW, TIFF formats and Compact Flash Type I or II, Microdrive memory. Probably, the idea of standardization will get more popular some day, but today the market has very few cameras and optical systems matching the Four Thirds standard. The Konica Minolta Dimage Z1 3Mp camera is not the most advanced but it has a wide range of new features (below you can see it with the wide angle-converter ZCW-100 x 0.75). The new model is equipped with a 10x lens which corresponds to the visual angle of a 35mm film camera with the 38-380mm lens. The converter makes the angle equivalent to the 28mm lens of the film camera. It's interesting that this camera allows viewing the LCD either on its back or through the eye-piece. You can switch it mechanically by closing the LCD with a shutter and rotating it. Other cameras of this price range use two LCDs of different sizes: one on the camera's back and the other hidden inside. I wonder whether the company saved on such solution taking into account that electronic parts are rapidly getting cheaper while mechanical parts are getting more expensive. 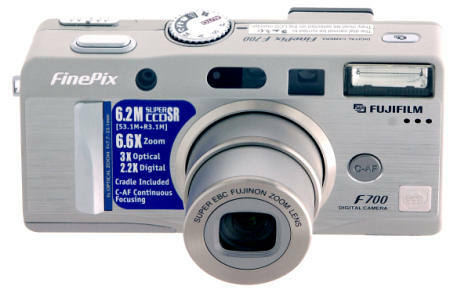 Another curious model is FinePix F700 from Fujifilm. 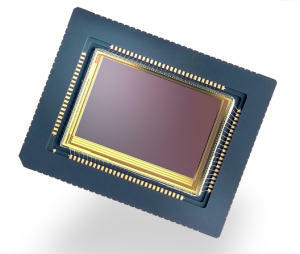 The camera is equipped with a 1/1.7" Super CCD SR matrix which has 6 mln sensors for 3 mln image pixels. It means that each pixel is serviced with 2 sensors of different size. Fujifilm thus increases the system dynamic range. It's quite possible that such matrix debuted in the amateur camera rather than in a professional solution because this is a completely new technology. However, the camera has a completely manual management of exposure parameters. Another intriguing tendency on the digital photo market is emerging of a new sector of digital reflex cameras with professional properties and exchangeable optical systems at the price of around $1,000. 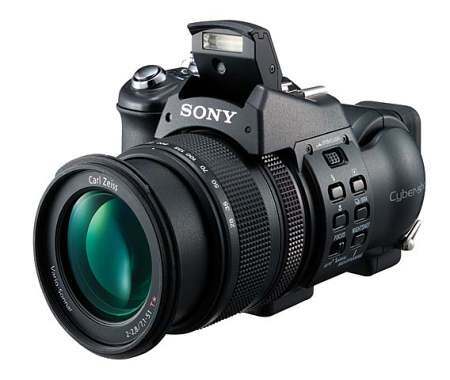 Such price is psychologically important: it looks tempting to make a step towards professional reflex cameras without spending thousands of dollars. 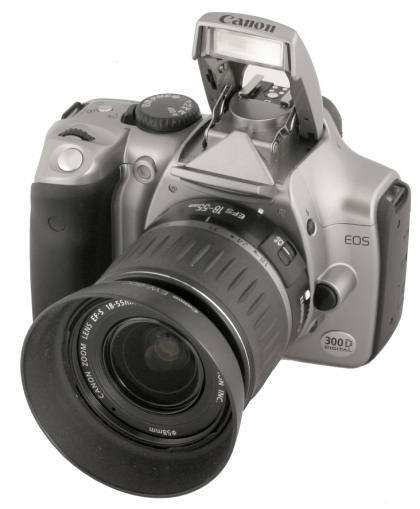 The sales of the Canon 300D shows that the demand for such inexpensive cameras with most charasteristics typical of professional DSLR cameras (although some of them are crippled) is tremendous. It also proves another idea that an advanced user who master a digital point-and-shoot camera is ready to get such relatively inexpensive camera believing that cameras lose their attractiveness but good optical systems will always be precious. 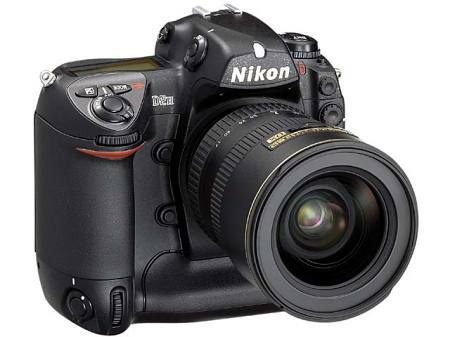 Nikon is expected to launch a competitor for the Canon 300D - Nikon D70 DSLR camera. 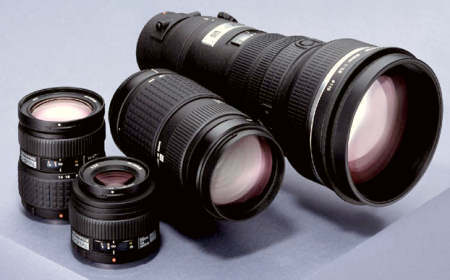 It will feature a mounting for the Nikon F, and the camera's price without an optical system is expected within $1,000. Simultaneously with the sales of the D70 the company also plans on starting selling its new optical equipment of the Zoom-Nikkor DX series (APS-C). It seems that they companies are well armed to fight for the new market of inexpensive DSLR cameras. At the moment Nikon delivers only higher-level camera - D2H. The sensor resolution is not great - only 4.1 mln pixels, but the matrix is curious. It's based on the LBCAST technology (Lateral Buried Charge Accumulator and Sensing Transistor Array), on junction field-effect transistors, and measures 23.1 x 15.5 mm which must help to reduce noise and render colors more accurately. The maximum sensor resolution is 2484 x 1636 pixels, at the aspect ratio of 3:2. In spite of a relatively low resolution the camera shoots very quickly: up to 40 frames in JPEG or up to 25 frames in RAW at 8 fps. The price is over $4,000, but I hope that the new matrix will be soon integrated in less expensive cameras (it's quite probable that the LBCAST version will be used for the D70). Pentax also entered this market by launching its *ist D SLR camera. The new model has a compact size - 129 x 95 x 60 mm. It's based on the 6.1Mp CCD matrix marked Sony ICX413AQ that measures 23.5 x 15.7 mm (like Nikon D100). Thus, it matches optical systems with the bayonet for M42 thread from Pentax or Zenit. The Pentax *ist D provides the maximum frame format of 3008 x 2008, a 16-segment lighting measurement system, a 11-point autofocus, a burst shooting at 2.7 fps and the exposure range up to 1/4000 s. The Pentax *ist D needs 4 AA or 2 CR-V3 batteries. Now a few words on development of the CMOS matrices from Foveon. 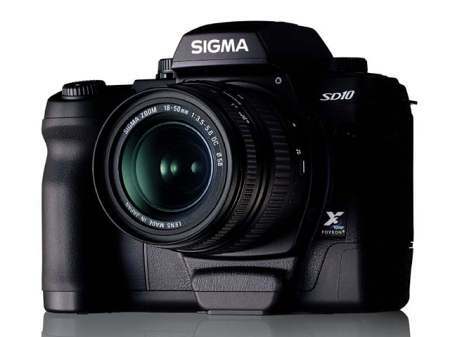 By the year-end Sigma announced its Sigma SD10 DSLR camera with the new Foveon X3 PRO 10M matrix. The F7X3-C9110 matrix (Foveon X3 PRO 10M) is similar in design to the previous Foveon X3 model: every light sensor has 3 photo detectors for red, green and blue colors. The photo detectors are located at different depths of the silicon die using the dispersion properties of the material to absorb light depending on wavelength. The shortest-wave blue color is absorbed first, that is why the blue photo detector lies closer to the surface. The green and red photo detectors are situated right under it. According to Foveon the new X3 PRO 10M matrix has twice greater sensitivity and the exposure time increased up to 30 s. The X3 PRO 10M sensor measures 13.8 x 20.7 mm; and there are 10.62 mln pixels in all, and 10.29 mln effective ones. The aspect ratio is 3:2. The Sigma SD10 supports RAW and the resolution up to 2268 x 1512 x 3 levels. There are 8 white balance settings, and the relative sensitivity can be adjusted within the range of 100, 200, 400, 800, 1600 (ISO). In spite of such a great deal of new solutions and various trends in development of digital cameras the current market state is not that wavy, and its further development doesn't look that vague. The Minolta A1 and Canon 300D which can be considered typical of our time, embody the ideas first voiced a couple of years ago. On the other hand, it's clear that some companies are run by marketers rather than engineers as many of them produce digital point-and-shoot cameras with small noisy but 5Mp matrices (!) - they simply play up to unexperienced users who do not know what combination of camera features can ensure really good image quality. However that may be the modern market of digital cameras is really great and rapidly developing. I do not doubt that at the current rate of development the mass culture of consumption of such goods will soon start quickly developing.